Included in Best Books of 2018 Lists from Refinery29, NPR, The Root, HuffPost, Vanity Fair, Bustle, Chicago Tribune, PopSugar, and The Undefeated. In one of the season’s most acclaimed works of fiction—longlisted for the National Book Award and winner of the PEN Open Book Award—Nafissa Thompson-Spires offers “a firecracker of a book...a triumph of storytelling: intelligent, acerbic, and ingenious” (Financial Times). Nafissa Thompson-Spires grapples with race, identity politics, and the contemporary middle class in this “vivid, fast, funny, way-smart, and verbally inventive” (George Saunders, author of Lincoln in the Bardo) collection. Each captivating story plunges headfirst into the lives of utterly original characters. Some are darkly humorous—two mothers exchanging snide remarks through notes in their kids’ backpacks—while others are devastatingly poignant. In the title story, when a cosplayer, dressed as his favorite anime character, is mistaken for a violent threat the consequences are dire; in another story, a teen struggles between her upper middle class upbringing and her desire to fully connect with so-called black culture. Thompson-Spires fearlessly shines a light on the simmering tensions and precariousness of black citizenship. Boldly resisting categorization and easy answers, Nafissa Thompson-Spires “has taken the best of what Toni Cade Bambara, Morgan Parker, and Junot Díaz do plus a whole lot of something we’ve never seen in American literature, blended it all together...giving us one of the finest short-story collections” (Kiese Laymon, author of Long Division). "Vivid, fast, funny, way-smart, and verbally inventive, these stories by the vastly talented Thompson-Spires create a compelling surface tension made of equal parts skepticism towards human nature and intense fondness of it. Located on the big questions, they are full of heart." "We need a new word for this story collection. Dark humor isn’t quite it. But it’s close. It’s dark; it’s funny; but it’s kind, too." Nafissa Thompson-Spires brilliantly delves into the concept of black identity in modern times in Heads of the Colored People, a collection that echoes the power of Junot Díaz and cements her role as an incredibly important voice in literature right now. "Presenting unique characters, gifted storyteller Thompson-Spires navigates the black experience with humor and poignancy while also acknowledging the inherent tensions and exposure to violence black citizens encounter. Highly Recommend." 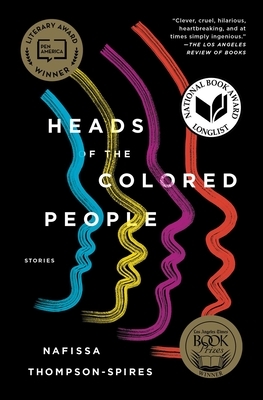 Darkly humorous and incredibly moving, Heads of the Colored People is a wonderful collection of short stories that tackles what it means to be black in a world that thinks it's "post-racial." (Spoiler alert: It's not.) The book couldn't be more timely — and even the stories that seem light-hearted on the surface are, at their center, incredibly intelligent reflections on race, identity, and blackness. Nafissa Thompson-Spires has written a masterpiece. “For the freshest voice in literature, look no further than Nafissa Thompson-Spires blisteringly clever short story collection, Heads of the Colored People… Sometimes, a voice comes around that is so singular, so funny, so wholly original, that you go back and reread each story once you finish it… In each of these humorous, intelligent vignettes, Thompson-Spires explores aspects of being Black and middle-class in today’s America. This is a special collection. Buy it so you can read it more than once." “This collection resonates on many frequencies. There are direct links between characters in several of the stories, many of whom are foils for each other, and their nuances are sure to strike a chord with any reader who’s struggled with insecurity and a search for self… Thompson-Spires writes with grace, a lightly bitter humor, and a real eye for a detail that calls attention to the simultaneous reality and fictionality of each story… A profound and truly enjoyable collection." "An unforgettable debut, Heads of the Colored People examines black identity in boundary-pushing new ways. Full of unique characters, the stories offer a mixture of humorous and dark tales. From mothers exchanging snide notes to a teen struggling with her identity, Thompson-Spires shines a light on the insecurity inherent in black citizenship." "Nafissa Thompson-Spires’ exquisitely original Heads of the Colored People is fresh, inventive and sure not to disappoint. Each short story starts in the familiar and then leads to unexpected and compelling revelations." "Thompson-Spires’ dazzling collection of short fiction addresses black identity in the so-called post-racial era... Transgressive and wildly funny, Heads announces a major new talent." "With a well-tuned ear for the cadence of comedy and dialogue, Thompson-Spires uses her characters to illustrate what real conversations about identity can be." "A writer to watch… Extraordinarily powerful.Thompson-Spires distinguishes her work by keeping explicit violence off the page and focusing on raw grief, pushing her readers to confront the senselessness based solely on the strength of her voice and her characters… [E]loquent, funny, forceful and occasionally shocking." "Here's an author to watch. Thompson-Spires' first story collection is a fascinating, lyrical, and profoundly moving examination of contemporary black identity." “Funny, smart, and #ofthemoment, this electrifying debut marks the emergence of a daring talent whose characters are as comfortable referencing Octavia Butler and Flannery O’Connor as they are dropping allusions to Fetty Wap and Patti Mayonnaise." "Superbly witty debut… The topics [Nafissa Thompson-Spires] takes on are often deadly serious (one is about an impending suicide), but every story flashes grim humor. She is also a brutally sharp observer. The epistolary story 'Belles Lettres' could have been written with a scalpel?"